“Gossip Girls” Jessica Szohr was recently spotted outside the NY Public Library carrying the Kooba’s 10th Anniversary Sienna bag. This bag has actually been on the market for about 5 years. 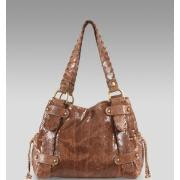 On Kooba's site, the bag retails for about $595.00. However, I also saw it on Neiman Marcus' site for about $695.00. Oh boy! This purse has a snake skin embellished appearance with gold hardware. It's super hot!